Daytona International Speedway – Daytona Beach, Fla.
· Ricky Stenhouse Jr. won the 59th annual Monster Energy NASCAR Cup Series (MENCS) Coke Zero 400 Powered by Coca-Cola at Daytona International Speedway Saturday night. It is Stenhouse’s second win in 165 career MENCS races and his second victory in 17 MENCS races this year. 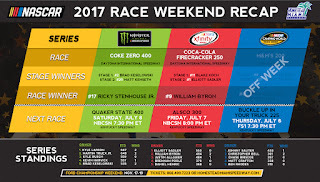 · It is Stenhouse’s seventh top-10 finish and fourth top-5 showing this year. In the process he became the fourth driver to win multiple MENCS races this year, joining Jimmie Johnson (3), Martin Truex Jr. (2) and Kyle Larson (2). · Prior to today’s win, Stenhouse’s best finish in 10 previous starts at Daytona was a fifth-place showing in last year’s Coke Zero 400. · Clint Bowyer (second) posted his second straight second-place finish after placing in the same spot last week at Sonoma. It marked his seventh top-10 finish in 17 races this year, four of which have been in the top-5. Overall, it was his third second-place finish in 2017 (Bristol). It was his best finish in 24 career MENCS starts at Daytona. His previous highs were three fourth-place showings. · Paul Menard (third) posted his third top-10 finish and second top-5 showing in 17 MENCS races this year. It was his best finish since a third-place showing at Talladega on May 3, 2015. It was his top finish at Daytona International Speedway, as his previous best was a fifth-place showing in this year’s Daytona 500. · Erik Jones (9th) was the highest finishing rookie. · Brad Keselowski won Stage 1 of Sunday’s race, while Matt Kenseth captured Stage 2. · Kyle Larson (667) leads the 2017 point standings by 18 points over Martin Truex Jr. (649). They are followed by Kyle Busch (559) and Kevin Harvick (557). · Ricky Stenhouse Jr. has made five career Monster Energy NASCAR Cup Series starts at Homestead-Miami Speedway and has yet to finish in the top-10. He celebrated XFINITY Series championships at Homestead-Miami Speedway in 2011 and 2012. · Rookie William Byron won the 16th annual Coca-Cola Firecracker 250 at Daytona International Speedway Saturday afternoon. It is Byron’s second victory in 15 career XFINITY Series races. It was also his second win in as many weeks after his victory last week in Iowa. · He became the third driver to win multiple XFINITY Series races this year, joining Kyle Larson (3) and Erik Jones (2). He is the first XFINITY regular to do this in 2017. · It is Byron’s ninth top-10 finish and fifth top-5 showing in 15 XFINITY races this year. · On Saturday he became the youngest XFINITY Series winner ever at Daytona International Speedway, one week after he became the youngest winner in an XFINITY race at Iowa Speedway. · Elliott Sadler (second) posted his 13th top-10 finish and seventh top-5 showing in 15 races this year. · Dakoda Armstrong (third) posted his second top-5 finish this year. His third-place finish Saturday marked his best in 121 career XFINITY Series races. His previous bests were a pair of fifth-place showings, one in 2016 and another earlier this year. 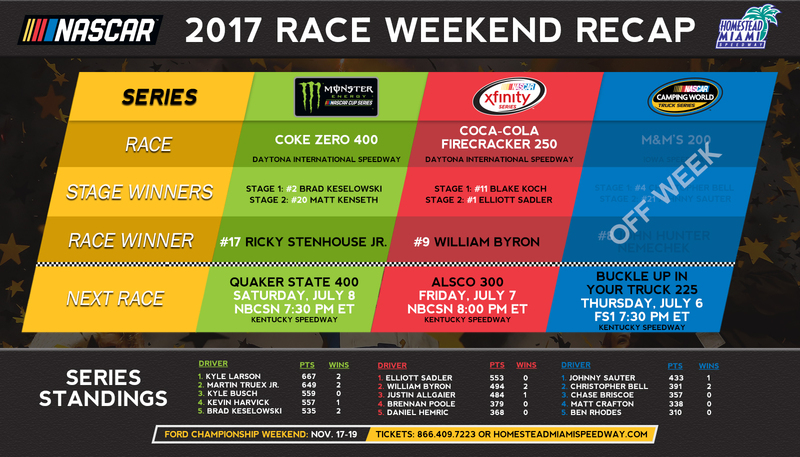 · Blake Koch won Stage 1 of Saturday’s race while Elliott Sadler captured Stage 2. For Koch, it was his first stage win of the year while Sadler secured his fourth, including his third at Daytona International Speedway. · With victories to their credit this year, William Byron (2), Justin Allgaier (1) and Ryan Reed (1) have clinched spots in the 12-driver playoff field in the 2017 NASCAR XFINITY Series Playoffs. The Playoffs culminate with the Ford EcoBoost 300 XFINITY Series championship race at Homestead-Miami Speedway on Saturday, November 18. · Elliott Sadler (553) leads the XFINITY Series points standings by 59 points over rookie William Byron (494). They are followed by Justin Allgaier (484). · The Camping World Truck Series was off this weekend. They will resume action on Thursday, July 6 with the Buckle Up In Your Truck 250 at Kentucky Speedway.